Custom Machine and Tool Co., Inc. can integrate the Concentric Maxi Torque bushing connection system in your most demanding hi-tech synchronous drive and rotating components. This patented systems enables you to easily phase; install; adjust; remove and reinstall drive components, all while offering precise component positioning. Bores sizes from inches 0.1250 (3mm) to 1.1875 inches (30mm) and torque capacities from 14 in-lbs (4Nm) to 2795 in-lbs (375Nm). Pulley and bushing are sold together as an assembly. There is a mechanical shrink fit affected by using a setscrew, axial to the shaft, as a lever to force the tapered bushing into the matching taper in the hub. As the lever forces the two tapers together, the slot in the bushing is compressed, thus clamping the pulley to the shaft with a mechanical shrink fit. That same set screw is removed and used on the opposite hole, which acts as a jack, releasing the shrink fit and allowing for removal or re-positioning. Innovative. The Concentric Maxi Torque system is a keyless hub-to-shaft connection designed and developed specifically to suit the needs of small shafts and drive components in the power transmission and motion control markets. This patented system enables customers to easily phase, install, adjust and remove drive components, all while offering precise component positioning. Concentric. With radial runout less than .001/.26mm as assembled, the Concentric Maxi Torque system enables customers to attain higher drive speeds, reduce unwanted vibration and maintains concentricity. Reliable. The mechanical shrink provides torque capacity which can exceed that of two setscrews arranged perpendicular to the shaft, offering the most reliable connection in the industry. Economical. The compact design eliminates the need for the extended hubs used to accommodate setscrews, allowing motion systems engineers to design drives which are lighter and use less space. Additionally, the shaft damage and added expense of shaft modification often associated with the use of setscrews or pins is eliminated. 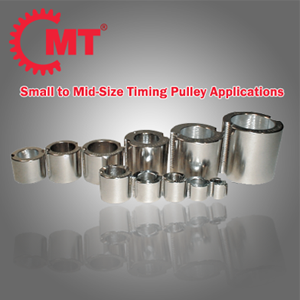 CMT maintains inventory offering same day shipping for timing pulleys with the Concentric Maxi Torque bushing system. We can provide these precision timing pulleys in all industry standard belt widths and any custom belt width desired. Zero backlash option also available. CMT's state-of-the-art manufacturing facility provides a full range of timing pulleys, timing pulley stock, and timing pulley flanges in aluminum, steel, stainless, plastic, brass and bronze for both stock and custom applications. Along with being an authorized Gates belt distributor, CMT is your one-stop shop in order to meet all of your motion control and power transmission needs!